In 1976 Soviet scientists at Dubna announced they had synthesized Element #107 by bombarding Bismuth with heavy nuclei of Chromium. Earlier experiments in 1975 had allowed scientists "to glimpse" the new element for 2/1000 seconds. A rapidly rotating cylinder, coated with a thin layer of Bismuth metal, was used as a target. This was bombarded by a stream of Chromium-54 ions fired tangentially. The existence of element #107 was confirmed in 1981 by Peter Armbruster, Gottfried Münzenber and their team at Gesellschaft für Schwerionenforschung (GSI) in Darmstadt, Germany, who created and identified six nuclei of element #107. Subsequently an international collaboration produced Bohrium and determined its volatility using a cyclotron at the Paul Scherrer Institute (PSI) in Bern, Switzerland. The 107 positive nuclear charge distorts the electronic structure of the atom by relativistic effects producing measurable deviations from chemical properties extrapolated from lighter family members. The PSI researchers used a beam of Neon 22 to bombard a target of Berkelium 249 (half-life of 320 days) prepared at Berkeley Lab from material made at Oak Ridge National Laboratory. Immediately swept into a gas analyzer developed by Gäggeler, the products formed molecules with Oxygen containing hydrogen chloride gas. These oxychlorides then passed through a chromatography column where more volatile species passed through at lower temperatures. Four molecules of a compound containing Bohrium 267 were volatile at 180°C, passed through the chromatography column, deposited on a rotating carrier, and then were identified by their radiation. The Bohrium 267 was unambiguously identified by alpha decay (with a half life of 15 seconds) to Dubnium 263, next to Lawrencium 259, and then to Mendelevium 255. 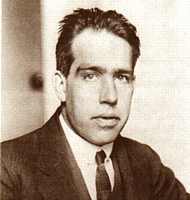 Niels Bohr (see photos), who made many contributions to atomic and nuclear theory, was originally honored by proposing his name for a different element. Russians working at Dubna proposed the name NielsBohrium (Ns) after they made element #105. Americans, who has also produced element #105, proposed the name Hahnium (Ha) after Otto Hahn, the chemist who claimed to discover fission. The IUPAC-IUPAP committee debated claims of priority of discovery for many years. Element #105 was eventually named Dubnium (Db) and element #107 was named Bohrium. Hahn (1879-1968) was born in Frankfurt, Germany, studied at universities in Frankfurt, Marburg, and Munich. He taught in Berlin then joined the Kaiser Wilhelm Institute (now Max Planck Institute) in Gottingen, eventually becoming its director and later its president. Lise Meitner worked at the Kaiser Wilhelm Institute under Hahn's auspice. Like several other teams trying to synthesize atoms larger than Uranium, Meitner and Hahn bombarded Uranium with neutrons. In 1938 Meitner had their colleague, Fritz Strassmann, chemically analyze some product. Meitner fed from Nazis Germany to avoid scheduled arrest because of her Jewish ancestry. Strassmann wrote to Meitner that he found that the product was chemically identical to Barium. Meitner realized that rather than combine with the neutron making a new atom somehow in the same chemical family as Barium, the Uranium had fissioned (broke apart) actually producing Barium as one of the pieces. Otto Hahn announced that he had discovered fission and won the 1944 Nobel Chemistry Prize for the discovery. The proposal to name an element honoring Hahn was abandoned after historians suggested that the discoverer of fission was probably Meitner. Hahn, probably learning of fission by letter from Meitner but failed to give her credit out of fear of German treatment for Jewish sympathizers. Niels Bohr (1885-1962) was born in Copenhagen, Denmark, where he graduated from University (photo to right with Margrethe). He studied under J.J. Thomson (who discovered the electron) and Ernest Rutherford at Cambridge University. Hans Geiger and Hans Marsden, working in Rutherford's lab, unexpectedly found alpha radiation was occasionally reflected from a Gold target. Rutherford deduced that this required a tiny but massive atomic core which he named the nucleus. Bohr knew that an atomic nucleus posed a dilemma for explaining the behavior of atomic electrons. In 1913 Bohr added Max Planck and Albert Einstein's radical quantum theory of energy to the atom by proposing that the momenta of electron orbits were restricted to multiples of Planck's constant. With this assumption he was able to very accurately account for the spectra of Hydrogen gas. 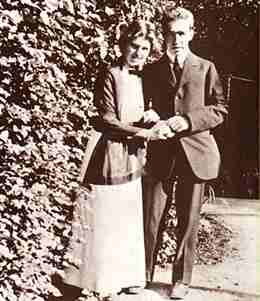 But Bohr's theory predicted incorrect spectra of atoms with more than one electron. His efforts to fix the theory failed. He returned to the University of Copenhagen to work on radioactive decay. For his work in atomic structure and radiation he received the 1922 Nobel prize in physics. (Photo to left shows Bohr with grand kids in front of the house purchased with his Nobel prize award.) Eventually Schrödinger and Heisenberg developed Quantum Wave Mechanics to replace Bohr's atomic theory. Working at the Niels Bohr Institute established by the Danish government, Bohr continued to be a leader and father-like organizer in the understanding of atoms and nuclei. 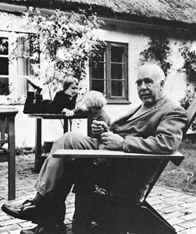 Bohr fled Denmark during the Nazis occupation, carrying the announcement of fission from Meitner to the United States. He assisted the resulting Allied development of the atomic bomb. After the war he explained the need for international control of atomic weapons to Washington before returning to Denmark. In August of 1997 the International Union of Pure and Applied Chemistry announced the official naming of element #105 after Dubna (Db), element #107 as Bohrium (Bh), and element #109 after Lise Meitner (Mt).